That looks soooo good! I don’t have any brandy in my house either lol. I do have sherry, that would probably work too. Yes, sherry would work Penny. It is more about the mustard and cream. Hope all is well in NC. I love mustard sauce! This would be a great dish for dinner. Tasty and pretty, too! Thanks Kate. Love easy pretty dishes. Hard liqueur is not my thing, so I am always surprised but what is or isn’t in our collection. Give me a glass of wine and I am fine. Use your brandy for this though and you will be happy Madonna. 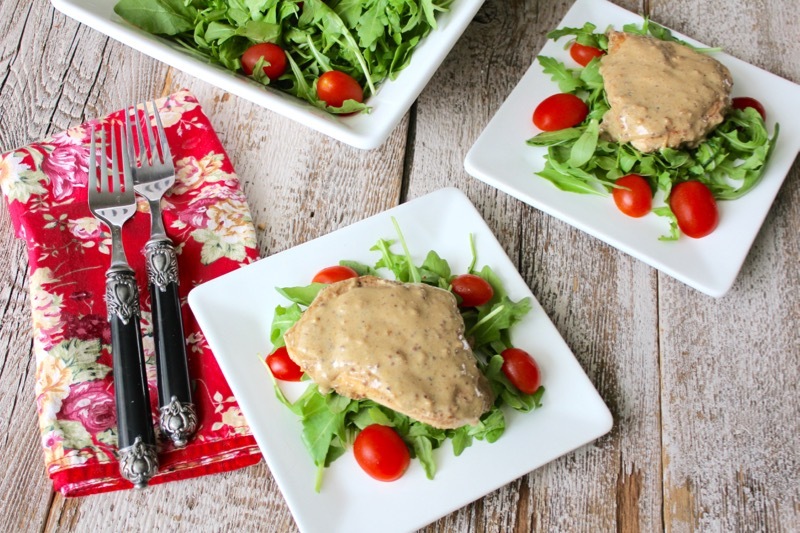 I love chicken over an arugula salad then dressing..sauce,yum! Somehow I knew you would like this Monique. Thank you. This sounds delicious, Penny, and I think your pictures make it look outstanding. I never have liquor in the house…we drink nothing stronger than wine or beer. I wonder if I could substitute red wine? We have a huge ‘beverage’ store nearby where you can get all sorts of quantities of liquors, I wonder if I could do the brandy that way. I buy a small bottle of Marsala for cooking as I don’t think it would be so great to drink! I think a small bottle of brandy would be better than red wine Jane, but white wine would work just as well. You guys have had lots of snow lately. My brother from Michigan is visiting us in Florida right now. He is glad to be out of the freezing cold. Looking forward to seeing you in Asheville when you visit. So coincidental, because I just bought some Dijon and inside the packaging was a recipe for Mushroom Chicken Breasts with Dijon Wine Sauce. The recipe calls for white wine but now I’m thinking of adding a little Brandy or Madeira 🙂 This looks delicious and I love the addition of arugula to the plate. The arugula makes me feel virtuous. But chicken and mustard are great together Susan. I love meals like this, Penny. On the light side with lots of flavor. I but the brandy adds a nice depth to the mustard sauce. 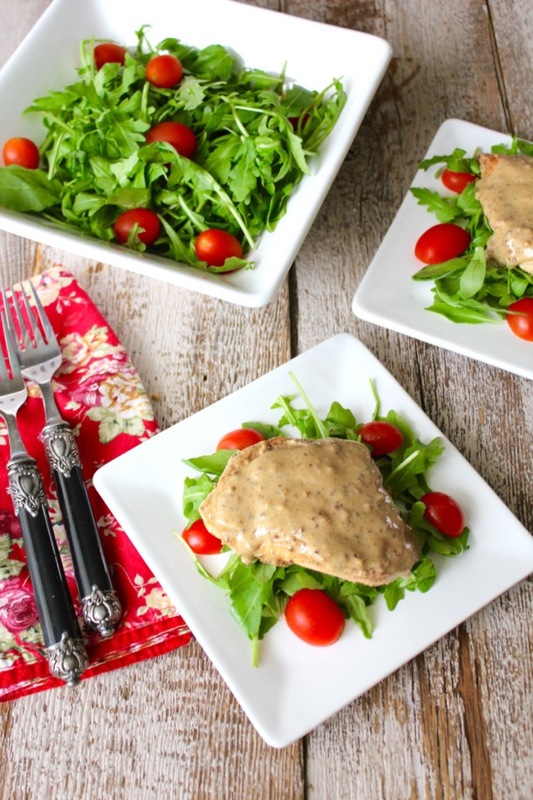 How would we ever get along without the very versatile chicken breasts? I agree Cathy. I bet I have hundreds of chicken breast recipes stored away. Thanks for stopping by. Hi Darley! Sorry it has taken me so long to respond. Your comment went to a pending file. Glad you are enjoying the blog. Looking forward to returning to Lake Lure. I have a chicken with mustard sauce recipe but I don’t remember if there was any brandy in it as it has been so long since I prepared it. 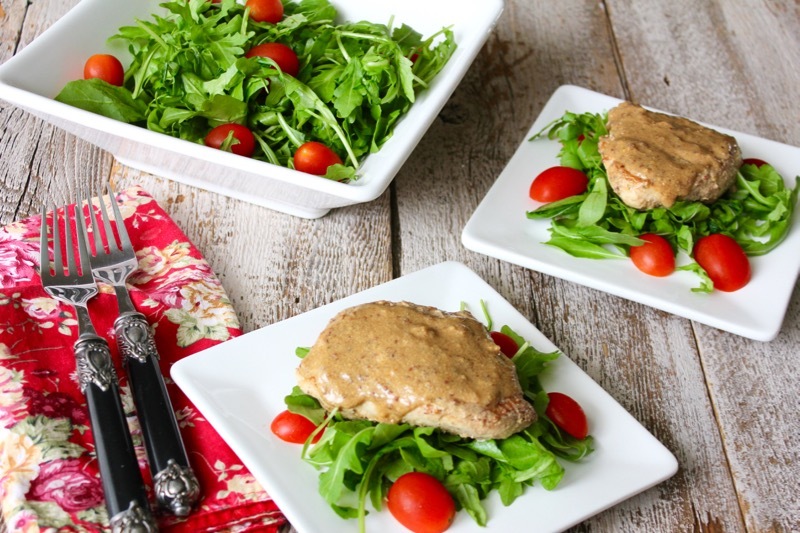 Your chicken topping the arugula looks terrific…must give it a try. Hope you try it Karen. Aren’t you glad we are in Florida right now? This post was published by Penny on January 13, 2016.